I really didn’t set any goals for myself this year. I do feel more confident in my math abilities because I have learned many ways to do new equations and work through new math issues. I had a really hard time balancing my classes as this was the largest workload I ever had, I feel like in the end though I learned more about perseverance and management of my work. I feel more prepared than I have in a long time for new math. For my project I decided to make a painting of the perfect face. I painted a piece of posterboard with red, blue and white paint and drew the marquardt beauty mask over it. I studied the golden ratio and phi and it's relation to beauty. According to the Human face and the Golden Ratio “The head forms a golden rectangle with the eyes at its midpoint. The mouth and nose are each placed at golden sections of the distance between the eyes and the bottom of the chin.” I learned that human beauty is based on divine proportion and symmetry. The closer your face matches the marquardt beauty mask the more beautiful you are. The human eye is attracted to symmetry and the more symmetrical your face is the more aesthetically pleasing your face is. The marquardt beauty mask works for all genders. I loved my independent research project, it gave me an opportunity to research a math subject that I could apply to my art. I really liked the freedom that this project allowed. The only thing that I would change about this project is more work time. I learned a lot about aesthetics and the math and science of beauty. Problem Statement: In this pow we were asked to find a way to explain the distance between flowers and a sprinkler without using the metaphor of flowers and a sprinkler. In other words state the problem in mathematical language without reference to the context. That is, describe the problem in geometric terms without talking about flowers or sprinklers. In this problem the solution was simple, all I had to do was find a way to show a way the flowers were placed to enable the equidistant placement of a sprinkler. It is obvious that the flowers can’t place flowers in a line or a right triangle because then the sprinkler can’t be equidistant from each flower. 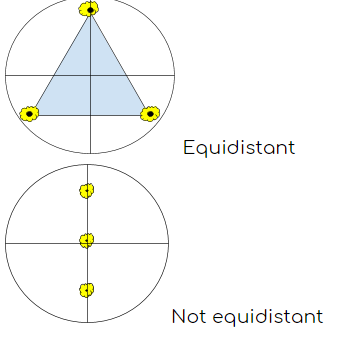 The only placement that works well is putting the sprinkler in the center of an equilateral triangle. This is because in any other formation of flowers the sprinkler wouldn’t reach equidistantly. If you placed the sprinkler anywhere besides in the center then it would not reach the flowers equally. Evaluation: This pow was pretty simple and to the point, it was easy to understand and crack. I really liked this pow it was not overly frustrating. Because the other pows were more complex I over thought this pow at first and did receive help. I chose this pow to show because I think it's the one I executed most successfully. To refine I wrote more for each section and refined my spelling and grammar. Self-Assessment: I think on this pow I did really well, I didn’t need any help solving it. I did really simple and understandable illustrations and I think all in all I deserve a b+. In this pow I was lost for a while I didn’t think that you could make a math equation without at least one number to plug in. But I decided to plug in a difference of one foot between each podium which led to me finding the equation ((y+1’)*x) with y being the starting height of the podium and x being the amount of podiums. This momentum led me to the equation for the tallest podium ((x+d)*y). This pow was complicated, at first I was confused and thought it would be impossible to finish, but with help from Hannah it was actually pretty straightforward and simple. I think that I did really good with this pow I cracked it in a few days and made the write up as simple as the problem. POW 1 The More the Merrier? Isn’t life more interesting when there are lots of people around? Then why should people be upset about the idea of a “population explosion”? Your task on this POW is to study some aspects of this rapid population growth and to find out why at least some people are concerned. You should write a report on your findings, which may include your own opinions and conjectures about why things are the way they are. Graphs, drawings, and tables are often helpful. Here are some suggestions for topics. You may choose other topics for your report. My POW topic is the pros and cons of limiting family sizes. Through studying this issue I decided that I am against population restrictions. This issue has potential to reduce population inflation, but in my opinion the cons are more dramatically harmful. You have to look at both sides and there is most certainly some considerable pros, all of which could help the population’s quality of life. The cons however are highly concerning, China has some major issues with morbid infanticide including drowning leaving them in boxes strangling them and suffocation. Also social issues that effect the population include possible heightened suicide rates, as the parents only have one child they put a lot of pressure on the child they do have. The inverse can be true as well. Overall there is no current solution to the population crisis. The first and third POWs were my favorite because they were straightforward and there wasn't a definitive answer. The purpose of this lab was to measure the conductivity, turbidity, temperature, pH, and streamflow of the three main creeks that flow into the Animas River (Mineral Creek, Cement Creek, Upper Animas) and determine how the given measurements will combine in the greater Animas. On October 12th, the junior class ventured to Silverton to measure the various qualities of three different streams that ultimately combine to form the Animas River. The qualities that we measured in this lab are the conductivity, turbidity, temperature, streamflow, pH, and oxygen levels within Mineral Creek, Cement Creek, and the Upper Animas. One group measured the Upper Animas from 10:00-11:15, the other measured Mineral Creek from 11:15-12:30, and the last measured Cement Creek from 1:15-2:30. Conductivity measures how easily the water conducts electricity; this can change based on the substances dissolved within the water, such as salt or various metals. Turbidity measures the cloudiness/clarity of the water; this changes as a result of the presence of different elements in the water, such as heavy metals. pH is the acidity or basicity of the water; this is affected by the minerals in the water, such as mining waste (iron, mercury, etc). Temperature varies based on the source of the stream as well as the conditions of the path the stream takes, such as underground of shaded/sunny areas. Dissolved oxygen in mg/L & % saturation measure how much oxygen is mixed in the water. Finally, streamflow measures how fast the river is moving as well as how much water is being pushed through over time. Back in Durango, our ultimate goal was to find out how the data gathered from these three creeks combines and how we might predict what these numbers will be. Sareth: I made a pivot table to include the data for all three streams (cement creek=C.C., mineral creek=M.C., and the upper animas=U.A.). I first made a table for temperature resulting in an average temperature of 9.483333 degrees celsius for C.C. An average temperature of 4.675 degrees celsius for U.A. and a average temperature of 6.85 degrees celsius for M.C. I next tabled the pH of the streams resulting in a pH of 3.818 for C.C., a pH of 4.675 for U.A., and a pH of 6.85 for M.C. I continued this method throughout the process of organizing the data collected and found the following averages. John: I created a pivot table to measure the pH of Cement creek, Mineral creek, and the upper Animas. My calculations resulted in cement creek with a pH of 3.818, upper Animas with a pH of 6.466, and mineral creek with a pH of 6.3475. I found the mean of these numbers to find the grand average of all three creeks resulting in 5.331166667. Next I found the temperature in celsius of the three creeks. 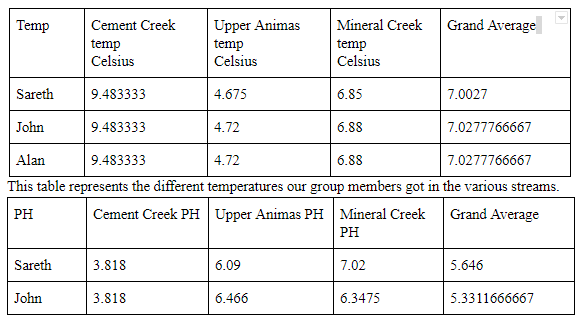 The temperatures I found for all three creeks was 9.483333 degrees (C) for Cement Creek, 4.72 degrees (C) for the upper Animas, and 6.88 degrees (C) for mineral creek. Using the same method as before, I found the mean of the temperatures of the creeks and then found the grand average at 7.0277766667 degrees C. However, I found that I was not able to calculate the dissolved oxygen (mg/L) or dissolved oxygen (% saturation), thus I eliminated them. I then repeated the same process to get the measurements of turbidity and conductivity. My grand average for turbidity was 8.839, and 575.333333333 for conductivity. Alan: After creating the pivot table, I began to examine the median and average for each data set and compare them. I found that they were almost identical for each data set, so I moved on to compare the average and standard deviation, as per Steve’s advice. I found that the standard deviation of conductivity in the Upper Animas was far too high for the average, and I concluded that this was due to a rogue data point of 865 among other points averaging at around 310. I then decided that this was likely a measurement that came about through a mistake on the part of the tester, so I removed it entirely. After that, I observed that the turbidity measured by each group was all over the chart, with points ranging anywhere from 34.4 to -17. It seemed that most of us were doing something wrong to get such bizarre measurements, but I could not determine exactly what that was. As a result, I decided that we cannot properly determine the turbidity of the Animas River at the time. The next wall that I encountered came when I examined the overall data for dissolved oxygen: There wasn’t any. 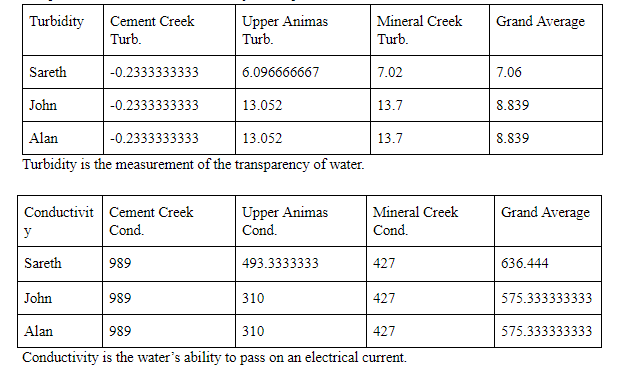 Due to the fact that the only measurements of this data point were from the Upper Animas group, I could not properly evaluate what the Animas River’s oxygen levels would be when combined with Mineral Creek and Cement Creek, unfortunately. The last issue that I ran into was that there were only two data points for Mineral Creek’s streamflow, so I simply noted that the streamflow will not be 100% accurate. Next, I decided to take the average streamflow of each river and try to find some way to make them into percentages. Remarkably, they all added up to 98 cf/s, which is quite close to 100. I used this to make a percentage value out of 100 for each river’s streamflow with the missing 2 out of 98 cf/s being negligible, due to the fact that it only makes up for one-fiftieth of the prediction. I then took the averages of our data points (conductivity, pH, etc.) and multiplied them into weighted averages using the % contribution of each river to the Animas through their streamflow. Mineral Creek made up for 47% of the streamflow (.47), Cement Creek was 26% (.26), and the Upper Animas was 25% (.25). Through using weighted averages and then adding them together, I believe that I got accurate results. To my understanding, the conductivity should be at 535.33, pH should be 5.899, the temperature should be 6.8784 C (though this will fluctuate over time due to sunlight, seasons, etc. ), turbidity should be 9.6422, and dissolved oxygen should be 2.1245mg/L or 23.55%. However, I have also noticed that going through this process without weighted averages gives very similar results. I believe that this was Sareth’s technique, and I must say that it was quite easier and admittedly brought results that were just as accurate. The three of us all had slightly varying results for our predictions, all of which were more or less similar to the USGS’s data; this is likely due to our varying techniques for our calculations. The main difference is the set of results which used weighted averages and the ones that did not, with another factor being that some of us deleted a few data points which did not make sense while others left them in. Neither method is necessarily correct, but both lead to answers which may be closer to the truth than the other method when compared with USGS’s data. The following data points will be for both methods of weighted averages and regular averages, respectively, along side the USGS’s data as well. It must also be noted that the USGS data is estimated due to the lack of data for October 12, as the river froze over and prevented their testing for that day. The numbers listed in place of definitive points will be based on the previous two weeks of collection and where the trend was going. Looking at the data above, it is easy to see that no one’s measurements conform to USGS’s data 100%. However, some are closer than others. For example, conductivity measured with weighted averages is more accurate than doing so with regular averages, but the turbidity appears to be significantly more accurate when using regular averages than with weighted averages. Sareth: I think that this project was successful and was an interesting experience to present us animas students. The field trip was a tad unorganized and confusing and I wish we would have learned more about the instruments we were using before going out and using them. I also didn’t like the presenter very much, it would have been much easier to focus if we were walking around. My favorite part of the trip was actually being hands on and being in the river. When we got back and organized our data and started making pivot tables is when I started really enjoying this project, I think that being able to use a spreadsheet is a good life skill and I appreciate learning it. I think that overall this is a very useful project to teach us more about our local environment. John: I would say that this project turned out to a successful learning experience with some minor room for improvement. Starting with the silverton trip, I would say most of it was well organized, however the end could have been a little better. I say this because I feel that we should have taken a tour instead of just listing to a presentation. For the water quality predictions and writeup I think things could have been much more organized. I say this because I was left without a partner. I think that the method used to arrange partners was not the best way. I think if it had been planned out better it would have worked out much better for me, and I would not have ended up without a partner. All in all, it was a fun and interesting project, but there could have been more thought into the planning of it. The importance of learning about the rivers and streams around us is very simple, these bodies of water are part of our everyday lives and it is useful to know how to measure their changes. Using a spreadsheet is also a very important thing to use in our everyday lives, organizing data and making presentations of this nature are part of many career fields, not just science and math. The most important thing to know how to do is measure and apply data to understand it deeper. Sareth: I have to be honest and say I wish I would have asked more questions, there were some simple definitions I had to look up to complete this process that I wish I would have just learned earlier in the project. I did much better with organizing the data than actually writing about it, I spent most of my time on the visual representations and wasn’t left with as much time as I would have liked to do the rest of the writing portion. John: I would say that overall I surprised myself with how I did. The reason I bring this up is due to the fact that I had a confusing situation with who I was supposed to work with for the calculations and creation of the data chart. Basically I was originally supposed to work with a student who was moved to a different group, thus leaving me without a partner. For about three days I did not have a partner to work with. Because of this I missed the most crucial part of the project process. Therefor I thought I was completely out of look and thought I was not going to be able to recover or even gain any knowledge on the process. However, I was fortunately able to find a group to work with. I definitely was far behind but I was able to learn some of what we were doing and at least get some important knowledge on calculating aspects of the rivers. In terms of the silverton trip, I felt that I was very successful in collecting data. All in all, I am pleasantly surprised with how I was able to turn things around after missing such an important part of the project. Alan: I would say that this went rather swimmingly! I feel as if I did some pretty decent work overall, but there are certainly a few areas that I think could have been better within my own work and the project overall. For example, a great deal of the data was flawed or missing from the sheet (namely turbidity and dissolved oxygen). I could have helped with this by asking more questions, such as asking Steve which turbidity measurements he thinks are correct (they surely shouldn’t have all been incorrect, and he would likely know which ones are in more reasonable parameters), or I could have made more of an effort to ensure both the quantity and quality of my group’s tests when we were in Silverton. Other than these rough areas, I think that everything was pretty good. I am also quite happy with the work that my group has put in for this lab report, as I most certainly could not have managed this on my own, let alone with such quality.